St. Honore is the patron saint of bakers and pastry chefs. But those are not the only professions which look to St. Honore for patronage. Confectioners (i.e.- candy makers) also call upon St. Honore for help. So today I am going to show you a recipe for a candy that you can make at home and give as a gift: Chocolate Coated Sea Salt Caramels. I first made caramels 7 years ago. I found a recipe in Pittsburgh Magazine for a walnut caramel which looked easy enough to execute. I chose to omit the walnuts called for in the recipe and just go with a plain caramel. The caramel is delicious: sweet with a hint of sea salt to give you that wonderful salty sweet flavor. Last year, my husband suggested dipping the caramels in chocolate. I always purchase a box of chocolate covered caramels produced by one of Pittsburgh's finest local confectioners, Sarris Candies. My husband asked me why I didn't dip my own caramels instead of buying a box of candy. Good question. This year, I decided to give it a go and I am glad that I did. There is one special piece of equipment that you will need for this recipe: a candy thermometer. Fortunately, you can find this in Target or K-Mart for a reasonable price. The candy thermometer clips to the side of the pot that you are using to make the caramels and easily allows you to see the temperature of the mixture in the pot. Before you start the candy, you want to prepare the pan using the same method that we use for quick breads. First, grease the bottom and sides of a 9 x 13 pan with unsalted butter. Then, insert a sheet of parchment paper into the pan and grease the parchment paper with the butter. 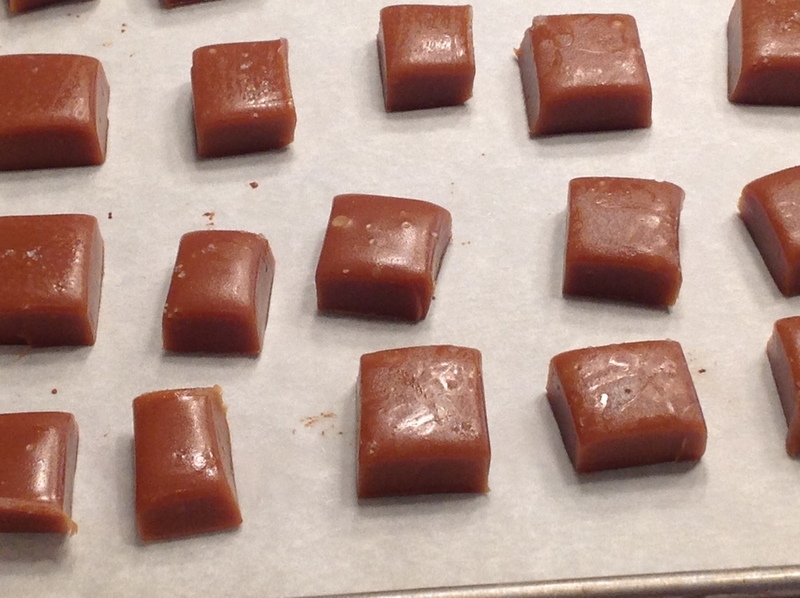 The parchment paper is essential to getting the cooled caramel out of the pan. After preparing your pan, you are ready to start making the candy. You need a large pot with high sides because the candy mixture will expand quite a bit as it cooks and you do NOT want it to boil over. For this recipe, you will need 4 cups of heavy cream, 1-1/3 cups light corn syrup, 1-1/3 cups honey, 2 cups granulated sugar, 8 ounces (2 sticks) of unsalted butter, softened, 1/2 teaspoon kosher salt, 1 teaspoon vanilla extract and 1/2 teaspoon sea salt. Clip the candy thermometer to the side of your pot and then mix together the cream, light corn syrup, honey and sugar in the pot. Heat the mixture until it reaches 260 degrees. You don't have to stir the mixture constantly but you do have to mix it often. DON'T WALK AWAY FROM THE POT! The photos to the right show the progression you will see as the mixture cooks. In the top photo, I have not yet turned on the heat under the pot. Note where the top of the mixture meets the thermometer. In the second photo, the mixture has been cooking about 10-12 minutes. As you can see, the mixture has expanded considerably. You will find that your mixture will get to about 216 degrees fairly quickly. Then it sits at that temperature for a very long time. Don't worry; this is normal. Just keep cooking and stirring. The temperature will start to creep up slowly. Then, when it hits 255 degrees, the temperature will rise quickly. The third photo shows the candy at 260 degrees. Just look at that wonderfully caramel color! Total cooking time to this point is about 35-40 minutes. When the mixture reaches 260 degrees, remove the pot from the heat and stir in the butter, kosher salt and vanilla. Keep stirring this mixture until all of the butter is melted and incorporated. If you see puddles of melted butter on top of the caramel, keep stirring. Everything will mix in together eventually. Pour this mixture into the prepared pan and then sprinkle on the 1/2 teaspoon of sea salt. Allow the candy to cool completely before cutting it, preferably over night. I wanted to dip my candy pieces so after cutting the caramels, I tempered about 24 ounces of bittersweet chocolate pieces. There are a number of good videos online which demonstrate how to temper chocolate. I found a video posted by Callebaut Chocolate which demonstrated how to temper chocolate using the microwave. After dipping about five pieces of candy in chocolate, I sprinkled on a bit of French grey sea salt so that the salt would adhere to the chocolate. Here's the finished chocolate coated caramels. May I suggest that when you eat one, turn the candy upside down so that the salt hits your taste buds simultaneously with the chocolate. This allows you to get the full effect of the salt with the chocolate. These caramels are delicious! I am going to have to hide them from my husband or there won't be any left for Christmas! This recipe is not that difficult but it does require some time. I think it is time well spent especially when you are making something special for your loved ones. Those happy smiles make it all worthwhile. "We Ga-a-ther Toge-e-ther to Sing the Lord's Praises ..."